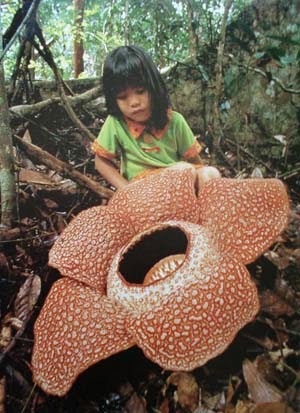 Rafflesia arnoldii is the largest individual flower on the Earth. It is a member of the genus Rafflesia which was found by French explorer and scientific Louis Auguste Deschamps in Java Island during his 3 years expedition. Unfortunately while he was returning in 1798, his ship was taken by the British with whom France was at war. His documents were all confiscated. In the next two decades, 1818, British botanist Joseph Arnold and statesman Sir Thomas Stamford Bingley Raffles collected a specimen of Rafflesia found by a Malay servant in Sumatra. Arnold died soon after the discovery. Rafflesia arnoldii can be found mostly in Indonesia, Malaysia, and Thailand. It is called "Padma Raksasa (Giant Flower)" by Indonesian. The flower has decaying flesh odor and so it is also called "Bunga Bangkai (Corpse Flower)". Rafflesia arnoldii reproduce by seed from pollination, then invades and penetrates the vine of other plants and absorbs nutrients and grows right on the top of it. Raflessia arnoldii is protected as it becomes nearly extinct. No response yet to "FACT: Rafflesia arnoldii is the largest flower on the Earth"